During a meeting a few months ago, the head of our development team showed us a chart. But this was not a normal chart. A gamut of colors, lines, and words, mostly indiscernible to non-developers, filled the screen like a jumbled mess of colorful spaghetti. This, we were told, is our new goal. After many pots of coffee, inspirational meetings, and finally putting a legend on the chart, a brand-new feature emerged from this tangled web: Olive Tree audio Bibles and books. After months of hard work, we have finally released this new feature in our app. You can get this new feature as soon as the update hits your device. For iOS devices, you’ll need to have iOS 10 or higher. For Android, you’ll need to be running 5.0 or higher. But, like most things we do, we want to go above and beyond expectations. We don’t want people to use our app to only read the Bible. We want people to study the Bible. 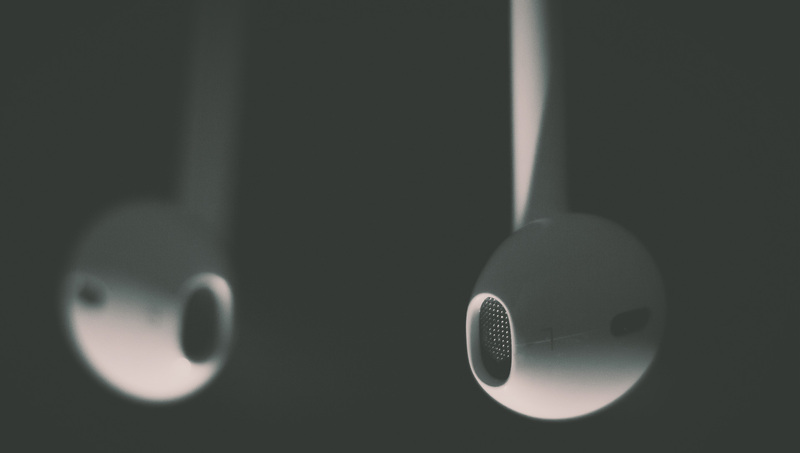 So, why would our audio experience only consist of listening to the Bible? That would be too easy. Here are 10 ways the Olive Tree audio feature will raise the bar. Rather watch a video? Scroll to the bottom. 1) WHERE DO YOU WANT TO START? If you’ve tried to listen to the Bible in an app not built by Christians, for Christians, then you know the pain of always starting audio at the beginning of a chapter (or worse, the beginning of a book!). What if you want to start at verse 43? 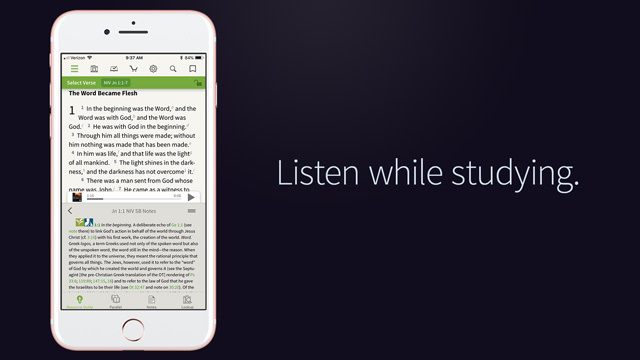 Enter Olive Tree’s verse-level navigation for audio Bibles. With the same familiarity of choosing where you want to start reading the Bible, you can choose where to start listening. Want to read as you listen? No problem. 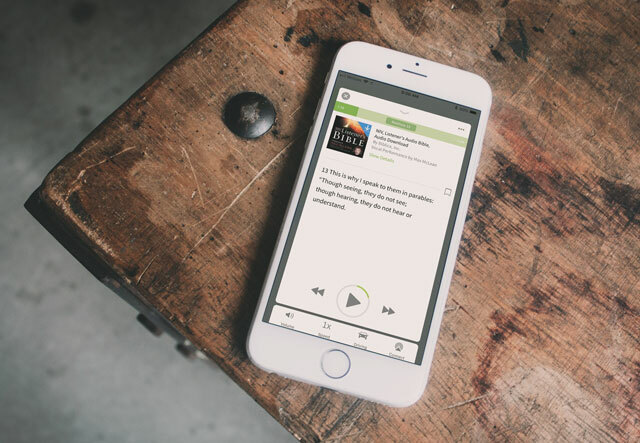 We’ll have the verse display on your device while the audio is running so you can read along—so long as you have the same Bible translation in your library. You get to be in charge of how fast or slow the audio plays. Speed controls can get those slow-talking narrators to pick up the pace. We have been working hard to get some of the best audio Bibles and books out there. Our store currently has over 12,000 different digital books and resources, and we are equally dedicated to providing as much quality, audio content as possible. 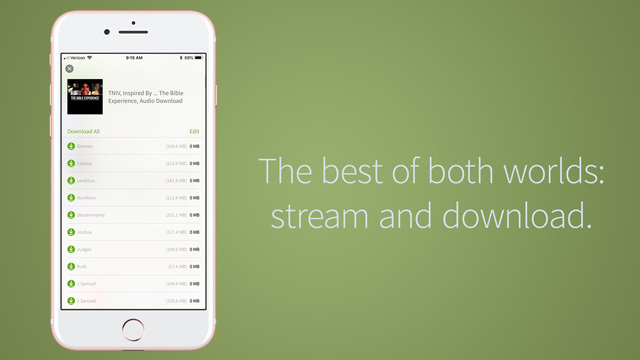 Most audio apps offer either streaming or downloading. 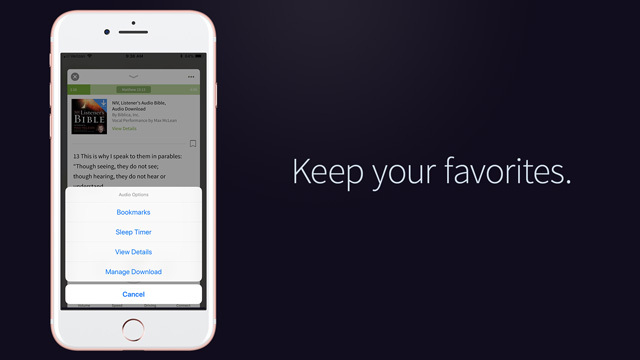 A survey of our users taught us that having both options is the crowd favorite. So, we decided to give the people what they want. We’ll even let you download individual books of the Bible to conserve space. 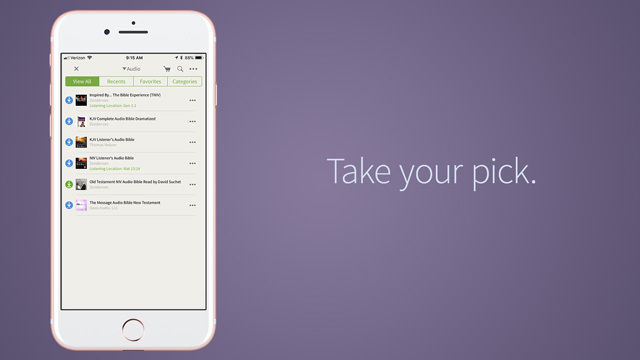 We wouldn’t want you deleting all those cute pictures of your dog from your phone. Want to remember your favorite parts without scrolling through audio? Easy. 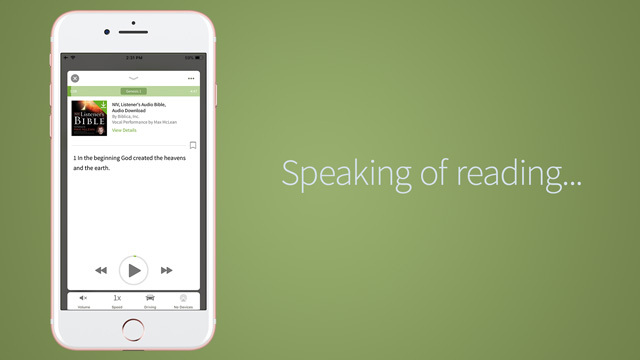 Create a bookmark or short clip of the audio for safekeeping. You’re free to stop listening and later continue where you left off. You shouldn’t have to start over just because you began listening on your iPhone in the car and can’t start again until tomorrow. Want to listen while you drive? We’ve included a driving mode that provides you with an easy-to-tap design. Being in God’s Word is important, but we would hate for you to be distracted behind the wheel. If you’re a multi-tasker, you’ll love this feature. 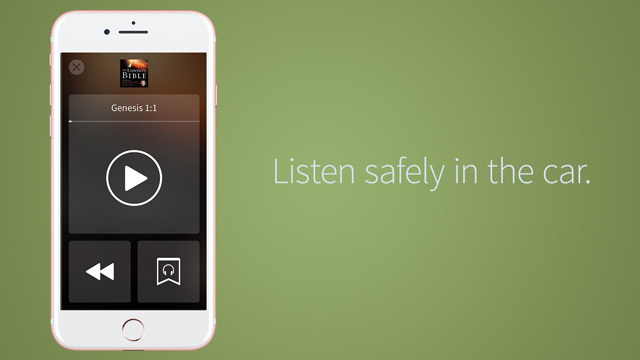 Using audio in our app won’t prevent you from accessing all your other resources. Instead, continue opening maps, comparing translations, reading commentaries, and taking notes. Lastly, this feature is added to our already popular, free app: the Olive Tree Bible App. There won’t be a separate app for audio. 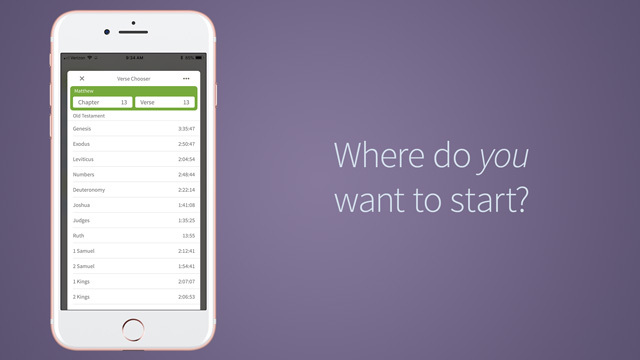 We want to keep everything easy to access, all in one place. 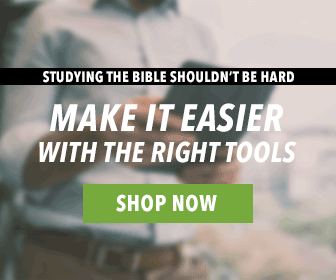 See all the new audio Bibles and books available on our store! This is a feature I have been waiting for! This sets your app, which was already ahead of the game, way beyond all the other apps out there! This is really really impressive. Some of features I have always thought of. God bless you for all the commitment and hard work. Permit me to pre-maturely ask how you are funded. I love the sound of this but because I live in the uk I can’t even download the app to my new phone. This means I can no longer access all those books and bibles I paid for. Please tell me when I will be able to download the app to my new iPhone? Really sorry, Kevin. We are waiting to hear from our legal department on GDPR implementation. Once they are able to give us next steps, we will immediately put their requirements in place so that we can get the apps back up on the EU app stores. Again, we are truly sorry for the inconvenience. I was recommending Olive Tree to a friend last week, he said it wasn’t available in Europe for GDPR reasons, I couldn’t believe that but a google search brought me here. When will the Olive Tree app be back on the UK/EU app stores? Hey, Martin! We still don’t have an ETA. But please know that we are doing everything we can. Is there an update on the GDPR situation please (re: access to the app from Europe and the Uk)? Like others have mentioned, I am also unable to access books I’ve purchased through the app over the years. What happens if the app never returns to the UK? Will users be compensated for their purchases they can no longer access? Is there an official thread/web page for tracking this issue? It’s a bit odd that there is not even an ETC on the GDPR review/implementation. Looks like it is not free. You have to buy the audio bibles. So why not just buy the audio Bibles? What advantage I using the Olive tree app? Split screen;. Then you can compare or refer to your commentaries. You can’t do that in other apps! Plus we should support OT, they have given me a tool that saves me from the need to carry a backpack when attending Bible study. Put your money where your heart is. Becky, did you read the list of 10 things? Most of those you can’t do with a regular audio bible that’s just sound files. I have plenty of audio Bibles that I’ve already paid for, so I’m unsure whether I’ll use audio in Olive Tree, but well done! This is a GREAT addition! I particularly like the ability to begin listening at any chapter or verse I choose. I do have a question. Do you plan to integrate the audio Bibles with the Bible reading plans? I do my reading plan by listening to the daily readings while driving to work. It would be great to be able to select a day’s reading assignment and automatically begin listening to that day’s reading. That’s a neat idea! Currently, our process for setting up reading plans needs some work. It’s one of our projects now that audio is done 🙂 We’ll hold onto your idea! This is actually quite high on our list of things to do. Stay tuned! David, great to hear! That’s the main feature I was hoping for when I heard about the audio. The other that I like is that you can navigate straight to a particular verse/chapter. Other audio bibles I have are more difficult to navigate. Audio sounds great but I live in the Uk and like Kevin I can no longer down load the app or the books that I’ve paid for over the last couple of years. Any idea how long I will have to wait for GDPR (whatever that is) so that I can take advantage of this great idea? I’m thrilled and yet so disappointed at the same time.. Now allow me to elaborate? I quite literally JUST (like, last week) bought the NKJV Word of Promise audio Bible through Audible. And it’s kind of a letdown that there are no markers between books, chapters, and verses. I SOOOO wish that I could carry it over to Olive Tree. I just can’t justify spending that amount of money to have it both places. If I had only known…. You know you can easily return the book to Audible, right? Audible has a great no hassle return policy. I would make use of it. I’ve returned more than one book on audible. It’s quite easy. I’d return it. This is exciting – except for the cost of the titles! A quick browse shows there seems to be no NLT version – is this correct? Probably the only audio Bible I would be willing to spend so much on. I have also noticed that the NLT Study Bible is still a very old version of the NLT text in Olivetree. Any comments as to whether either of this will change going forward? I was thinking the same thing – exciting, yet costly! So I checked my other Bible app that I usually listen to scripture in, and yep, it’s all free (including the NLT). The only place OT really would win out is in the ability to start at any verse, only chapters in the YouVersion app. So, for now I’ll listen to audio in YouVersion and do my reading plan in OliveTree. Btw, audio bibles have been available for free in YouVersion for years – glad OT joined in. Adam, keep in mind the cost is there to fund ongoing support of the app. Without an on-going subscription cost, that’s how they can pay to keep making improvements to the app. And the features here do really make it more user friendly than the less expensive Audible audio Bible I’ve purchased in the past. We all just have to decide if we can/should afford to buy the titles. 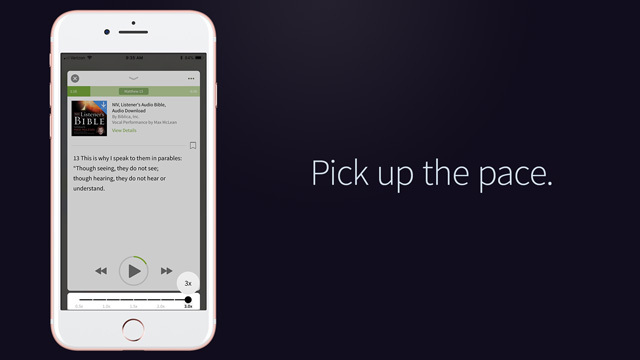 When listening to audio, can you navigate to other apps and have the audio continue? And will the audio part of the app support Siri? The audio does continue to play if you leave the app. I’m unsure about whether/when Siri support will be added. My hope is “soon”. Lol. As Martin said: yes, audio will continue, even if you lock your screen. No, we do not support Siri Shortcuts at this time, but it is something we would like to experiment with at some point. Thank you so much for making it downloadable, that’s the difference between me being able to actually listen to it or not listen to me. I thank God for the service that you’ll provide. How much space would the whole audio Bible use? Any chance of the CEV in audio? How about NIV without music? For an example, the TNIV Inspired By… The Bible Experience, Audio Download is roughly 5.5 GB for the entire Bible. However, we make it possible to download and easily archive individual books of the Bible. You also can stream instead of downloading. We do not have the CEV. As for the NIV without music… we have the New International Reader’s Version that in plain voice https://www.olivetree.com/store/product.php?productid=45276 that is the closest we have. The NIV Listener’s Audio Bible has very subtle music. This is just great! All in one app – exactly what I’ve been waiting for. I have a question about the narrators. I have low frequency hearing loss, and I struggle to hear male voices. Do you have any translation with a female narrator? There may be other users who prefer to hear a female voice reading? Sadly, it looks like the only female voices are in the audio Bibles that contain a full cast. Hopefully, as time goes on, we will acquire more and more audio Bibles. Audio books are a separate product from our other digital products. So, say you have the NIV Bible on your device. You won’t automatically have an NIV Audio Bible. This is because the audio Bible was produced and distributed by a different group of people. Did that answer your question? How big is the file if I were to download the entire NIV audio bible? Thank you. Looks great! Listening while driving would be my primary method for this and the ability to download is amazing so I don’t have to stream and rack up data charges. Nice! I’m wondering if you plan on creating a CarPlay version in future updates in order to control the audio? Especially now that iOS 12 supports third party apps for CarPlay? I want to listen to the bible using a reading plan. Can I repeatedly listen to John chapters 1-3? Though I have Youversion, I use Olive Tree as it gives all the hyperlinks, unlike Youversion. I bought several commentaries as well. However, I think Youversion is still a better option for Audio Bible as it has been providing Audio Bibles for free. I felt the same way. But I’m determined to support OT! That cost $$$ but the app has blessed me beyond any other Christian tool I’ve ever used. This includes my paper versions, the ability to carry my entire library with me, bounce from translation to translation effortlessly. Smooth and stable (if you don’t count the MACOS version) on my iPad. Well just to bottom line this, put your money where your heart is. The Olive Tree App needs our support. THANK YOU THANK YOU THANK YOU!!! I’ve been going crazy trying to use audio bibles from other sources. Without the guide it was impossible to use. I had to have a piece of paper and reference it to find what I was looking for. I was almost going to give up, but did a Google search and you all came up. Glad you found us, Dave! If I buy an audiobook Bible. Will it work with the reading plans in the Olive Tree app.? Hey, Kenneth! Great question! Currently, audio Bibles don’t work with reading plans in the app. However, we do hope to add that feature in the future! Is it possible for OT to support text-to-speech (TTS) for text?